Published: Sat Feb 28, 2009 | Updated: Sun Apr 22, 2018 | by Julian Knight Reading time ~3 min. Update 2018-04-22: Reformatted after move from WordPress to Hugo. Wow! I’ve just discovered by accident that Windows 7 beta supports a few IPTC XMP attributes in picture files. At last, Microsoft supporting standards! Above is a screen shot from the properties of a test picture. The Description and Origin sections seem to be standard IPTC fields and I checked them out using iTag. In iTag the Title attribute comes out as both the Title and the Description. The Subject field doesn’t seem to be recognised nor does the comments field. Rating, Tags, Authors and Copyright are all recognised by iTag. I’ll do some more extensive testing when I get time. I spoke too soon. In fact, it’s rather more complex. Using ExifTool with ExiftoolGUI, I can see that actually, Windows 7 sets BOTH some EXIF attributes and some XMP (the Adobe meta data format) attributes but NOT IPTC attributes. As it happens, iTag also understands these. Here is a table of what seems to get set. 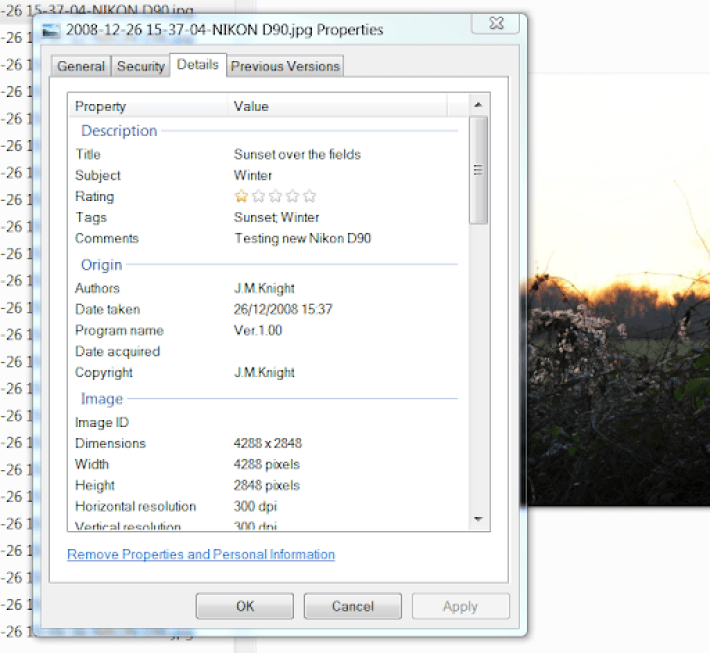 The XP... EXIF attributes seem to be Windows specific as ExifToolGUI doesn’t offer an edit feature for them, just lists them. So, a rather typically Microsoft mixed bag. Why wasn’t the XMP Description attribute mapped to Windows Comments? Similarly for EXIF UserComment! Still, it is something anyway and hopefully the table will help you choose which attributes to use for the best cross-tool support. I will try to add some more applications to the table if I get a change, if you get there before me, please let me know and I will add the details here. A quick look at Wikipedia shows that Microsoft seem to be backing XMP as support is built in to a number of their photo tools. In the past I’ve stayed away from this as only Adobe and other expensive products supported it whereas IPTC had more widespread support. It seems that this may be changing now – typical. Time perhaps to find a way to copy all those IPTC attributes in my photos across to XMP. See my note about what happens with Windows 7 and iTag updates. This is BAD. Windows 7 rides roughshod over several attributes. Even worse, iTag was unable to reopen the file after Windows 7 had updated it. So do not use Windows 7 to update image attributes if you also want to use other, more professional tools. Next: Sun’s VirtualBox gets on with it!